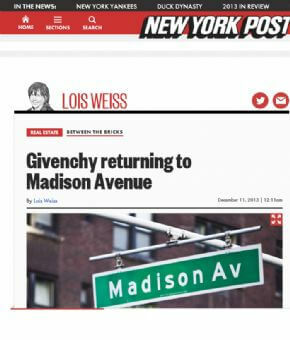 If she were alive, Audrey Hepburn would have breakfast at Givenchys when it returns to Madison Avenue next fall. Between the Bricks has learned the haute couture designer has inked a deal to inhabit a ritzy corner at 747 Madison next to its own former designer, Alexander McQueen. The upcoming 2,800-square-foot storefront at the southeast corner of East 65th Street that was just leased by Givenchy is now solely owned by retail magician Jeff Sutton. The 15-year deal in the base of the cooperative at 30 E. 65th St. had an asking rent of roughly $1,700 a foot. It also has a 1,000-square-foot mezzanine and 1,500-square-foot storage basement. The LVMH-owned Givenchy was represented by Joel Isaacs of Isaacs and Co., who was attending the International Council of Shopping Centers event and did not return requests for comment. Sutton, named No. 273 this year on the Forbes list of 400 richest Americans, was also unreachable, but this deal is indicative of his magical skills at minting money from storefronts. As we first reported a year ago, Sutton and then-partner SL Green Realty Corp. purchased the co-op shares representing the former Valentino store for $66.25 million. In June, they scooped up a second-floor unit for $2.6 million, enabling an increase in the ceiling height and leasing an in-line store to Alexander McQueen to move up from the Meatpacking District. That asking rent was $1,300 per foot, and luxury retail rents just keep rising. The new Givenchy boutique will engulf yet another second-floor apartment being purchased by Sutton so as to create a dramatic, double-height space for its target 2014 holiday opening. Without disclosing the tenant, SL Green on Monday said it had leased the other store to a major European fashion house and was selling its 33.3 percent interest in the co-op to Sutton, but also making a $30 million preferred equity investment. The deal magically revalues the asset to $160 million a $90 million-plus increase for the year. Givenchys previous store at 710 Madison closed in 2008. Earlier this month, CEO Sebastian Suhl disclosed plans to open boutiques in Las Vegas and Miami and on Upper Madison. In other SLG/Sutton news, while retaining 152,000 feet of development rights, Sutton will also spend $195 million to purchase SLGs 50 percent of 21-29 W. 34th St., where Aldo and Geox rent and Esprit subleases from Apple. But SLG is tossing in $100 million as a participating structured investment toward Suttons $327 million purchase of 530-536 Broadway from Joseph Sit ts Thor Equities that we also revealed earlier this year.